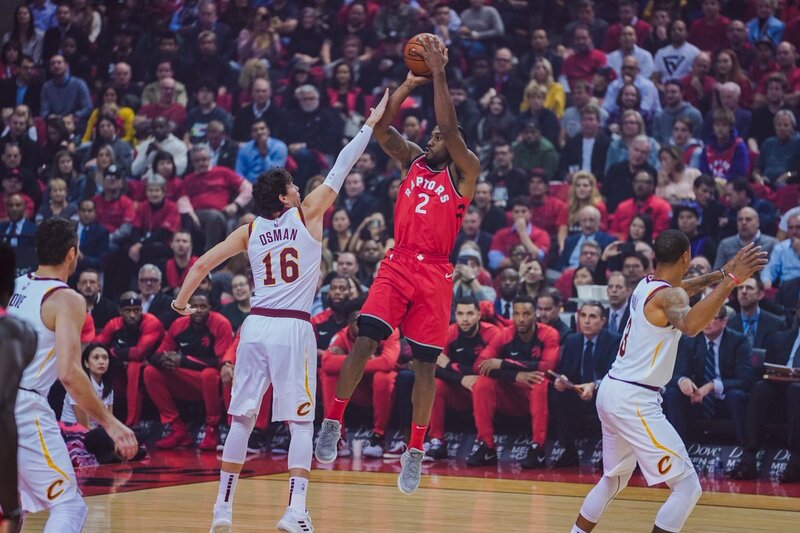 The Toronto Raptors defeated the Cleveland Cavaliers by a score of 116-104 on Wednesday night at Scotiabank Arena. This was the first time in 10 years that the Raptors had started their season without Demar DeRozan. The new backcourt of Kyle Lowry and Kawhi Leonard combined for 51 points on the night. Lowry scored 27 and had eight assists while Leonard had 13 rebounds to go with his 24 points. The presence of “The Klaw” was lacking in the first quarter but picked up throughout the rest of the game. One of the highlights of the night came from Leonard as he cleaned up an initial Jonas Valanciunas three-point attempt. Pascal Siakam scored 13 points as he started in place of Serge Ibaka, while Ibaka played seven more minutes than Siakam due to early foul trouble. Danny Green was quiet on the night for the most part, finishing with 11 points but showing his range from deep. Kyle Lowry looked his same old self on both ends of the floor, ending the first half with this sweet play. OG Anunoby suffered a right orbital contusion during the first half and did not return, although he will be in the lineup for the game against the Boston Celtics. The Raptors host the Boston Celtics on Friday night, with tip-off set for 8 p.m.